Star Wars wouldn't be the same without Darth Vader. 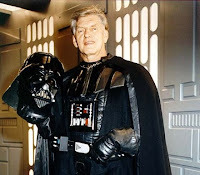 Darth Vader IS David Prowse. We know that David Prowse has been "uninvited" from Star Wars Convention V (C5) and you may be asking yourself: What can I do? Corporations own the name and licenses, but Star Wars exists because of the fans. Fans promote Star Wars. Fans buy the products. Fans can correct this travesty of justice and bring David Prowse back to Star Wars. If the fans decide they want to see David Prowse at a convention, then he will have to be there no matter what LucasFilm says. Contact ReedPop (the convention promoters), LucasFilm Ltd and anyone else you think may be able to help. 3. Support David Prowse Go to his website (http://www.darthvader-starwars.com/) and buy an item or send him something to sign. Send him an email showing your support. Do you want to see David Prowse at C5? Do you think we can bring him back to Star Wars?